Update your dining chairs and you can change the look of your space. 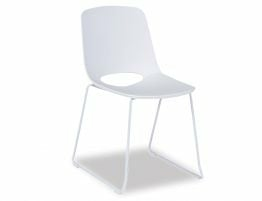 Spanish designers Enrique Del Amo and Angel Marti set out to create the perfect white cafe chair and the Wasowsky is certainly that. 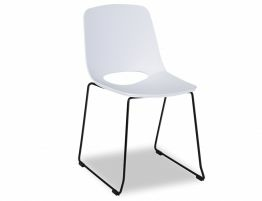 This white modern dining chair features a clean modern look with a soft moulded seat and a chromed steel base/legs. 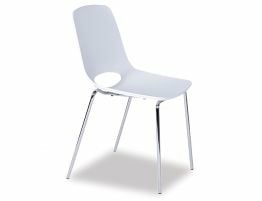 The Wasowsky white cafe chair is reminiscent of the Midcentury Modern chairs but with a few key updated details. 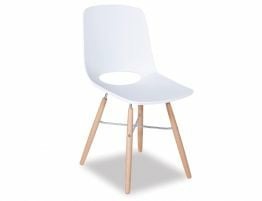 A soft, rounded seat makes this white kitchen chair comfortable and easy to wipe down between uses. 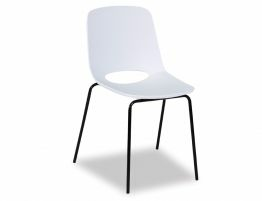 A decorative cutout in the back gives this white modern dining chair an airy and lightweight feel. 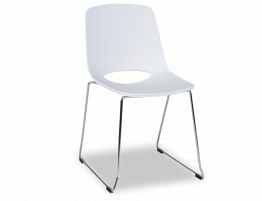 The Wasowsky white dining chair is made form an advanced techno-polymer and chromed steel legs add stability and a modern edgy feel to this white café chair. 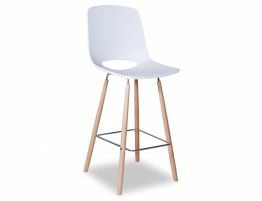 Arrange these white modern dining chairs in your contemporary kitchen, a informal dining room or your bustling restaurant or café.